I'm sorry I'll have to say goodbye this way, not in person. My symptoms got a lot worse a week or so ago and I decided to do a process of VSED (voluntarily stopping eating and drinking) in order to die faster and with less suffering. I haven't drunk anything for over 72 hours now and should (according to what I have read and been told) start "fading" soon, and die within a couple weeks at most. I've also stopped my chemotherapy. Goodbye Irv. I'd known from the onset of our work that Ellie would die from her cancer, but, even so, I was stunned by this message. I closed my computer, put my work aside, and stared at the ocean. Ellie first entered my life five months earlier, also via email. About a year or so ago I attended your radio interview at The Marsh Theater in San Francisco and felt immediately that you would be a great person to consult. I also liked your book "Staring at the Sun." My situation is that I'm 63 years old and have a fatal illness (recurrent ovarian cancer, initially diagnosed about 3 years ago). I'm currently feeling quite well physically, but I'm in the process of going through all the known chemo drugs that keep the disease in check and, as each drug outwears its usefulness, I can feel that endpoint drawing nearer. I feel I could use some help figuring out what's the best way to live under the circumstances. I think, no, I'm certain, that I think too much about dying. I'm not thinking of on-going therapy but perhaps one or two sessions. I didn't experience Ellie's email as unwelcome or unusual (aside from being well written and fastidiously punctuated). I almost always have one or two terminally ill patients in my practice and have grown confident that I can offer something of value even in a brief consultation. I replied immediately, offering her an appointment a week later, giving my address, and informing her of my fee. 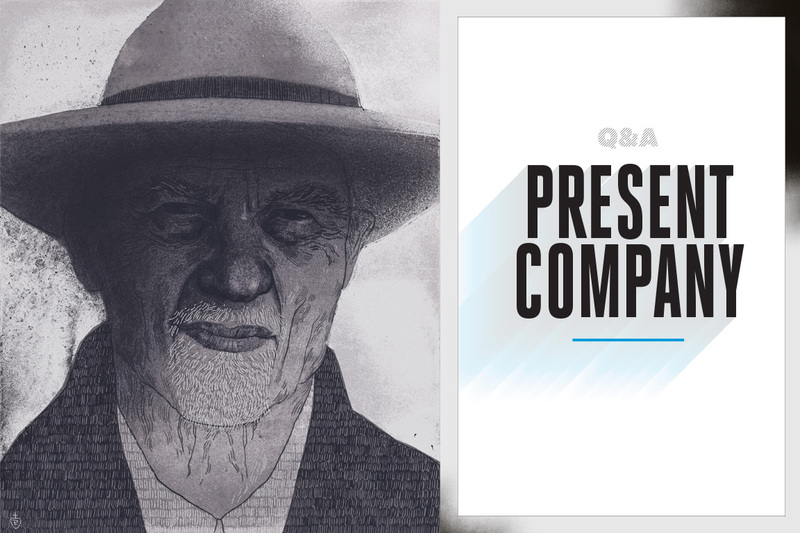 Q&A: Psychiatrist Irvin D. Yalom, BA ’52, talks about life, legacy and the value of focusing on the here and now. Her first words as she appeared in the doorway of my San Francisco office, perspiring profusely and fanning herself with a folded newspaper, were "Water, please!" She had raced to catch a bus at the corner near her apartment in the Mission district and then climbed two steep blocks to my office at the top of Russian Hill. Aging and small in stature, about five foot two, apparently inattentive to her appearance, with tangled hair that cried out for brushing, loose, shapeless clothing, and no jewelry or makeup, Ellie struck me as a faded, wistful flower child, a refugee from the sixties. Her lips were pale and cracked, her face showed weariness, perhaps even despair, but her eyes—her wide, brown eyes—gleamed with intensity. After fetching a glass of ice water and placing it on a small table next to the chair where she would sit, I took my seat across from her. "I know what a climb you've had to get here, so catch your breath, cool off a bit, and then let's begin." She took no recovery time. "I've read some of your books, and I can hardly believe I'm here in your office. I'm grateful, most grateful, to you for responding so quickly." "Tell me more of what I should know about you and how I might be helpful." Ellie chose to begin with her medical history and described at length, in a mechanical tone, the course of her ovarian cancer. When I commented that she almost seemed detached from her own words, she nodded her head and responded, "Sometimes I go on automatic pilot. So many times have I gone over this story. Too many times! But hey, hey," she hastened to add, "I'm cooperating. I know you need to know my medical history. I know you must know it. And yet, still, I don't want you to define me as a cancer patient." "That I shan't do, Ellie. I promise. But, still, fill me in a bit more. Your email states that you've exhausted the usefulness of several chemotherapy drugs. What does your oncologist tell you? How sick are you?" "His words to me a month ago at our last visit were 'We're running out of options.' I know him well. I've studied him a long time. I know his sanitized, coded way of speaking. I knew he was really saying, 'This cancer is eating you alive, Ellie, and I can't stop it.' He's tried all the new drugs, and each one had its day in the sun: each one worked for a while and then weakened and finally grew entirely ineffective. A month ago at our visit, I pressed him hard, really hard, for straight info. He fidgeted a bit. He looked so uncomfortable and so sad, I felt guilty for pressuring him. He's a really good guy. Finally, he replied, 'I'm so sorry, but I don't think we have more than a year.'" "A hard message to hear, Ellie." "In one way, yes, very hard. But in another way I almost felt relief. Relief at finally, finally getting a straight message from the medical profession. I knew it was coming. He didn't tell me anything I didn't know. After all, I heard him say two years ago that it was highly unlikely I would survive this cancer. During this time I've had a whole parade of feelings. At first I was appalled by the word 'cancer.' I felt polluted. Terrorized. Ruined. It's hard to remember those times, but I'm a writer by trade and jotted down descriptions of my feelings during that period. I'll gladly email them to you if you'd like." "I'd very much like to see them." And indeed I meant it. Ellie struck me as uncommonly lucid and articulate. Rarely had I heard a patient discuss mortal issues so forthrightly. "Gradually," she continued, "much of that terror has lifted, though there are still times I scare myself by imagining what my cancer looks like, and I search the web for hours for pictures of ovaries infested with cancer. I wonder if it's bulging, if it's about to burst open and spew cancer seeds all over my abdomen. Of course I'm just guessing about all this, but one thing I know for sure is that the idea of limited time has changed the way I plan to live." "So many ways. For one thing, I feel different about money, way different. I don't have much money, but I figure I might as well spend what I have. I've never had much. I've worked most of my life at lowpaying jobs as a science writer and editor ..."
"Oh, that explains that beautifully written, meticulously punctuated email." "Yes. God, I abhor what email is doing to language!" Ellie's voice grew more charged. "No one cares about spelling or punctuation or happy, fulfilled sentences. Be careful—I could talk forever about that." "Sorry, I've gotten you off track. You were speaking of your attitude toward money." "Right. I've never made much, never focused on it. And having never married nor had children, I see no point in leaving money behind. So, after my last talk with my oncologist, I made a big decision: I'm going to blow my savings and take a trip with a friend to all the places I've always wanted to see in Europe. It's going to be a grand tour, a real first-class splurge." Ellie's face sparkled, and her voice grew enlivened. "I am so looking forward to this. I suppose I'm gambling, making a bet that my doctor is right. He said one year, so I've given myself a bit of a margin and put aside enough money to keep me going for a year and a half, and I am going to blow all the rest on my trip. It'll be a blast." "And if your doctor's wrong? If you live longer than that?" "If he is wrong, then, to put it in technical terms, I'm totally [expletive]." Ellie flashed a big mischievous grin, and I grinned right back. I got a big kick out of her bet. I've always been a betting man myself, never turning down an offer to bet with my friends, even my children, on baseball or football games, enjoying my few trips to the horse races, and always relishing my ongoing poker game. Moreover, I felt delighted at the thought of Ellie's grand tour. She described the busyness in her mind. "I have some good days, but too often I picture myself in the future: weak, declining, close to death. I often ask myself, 'Will I crave to have people with me at the end? Will I be afraid to be alone? Will I be a burden to others?' Sometimes I imagine behaving like a dying animal and crawling off into a cave to hide from the world. I live alone. I don't like it, and sometimes I think of doing what I used to do, renting a huge place and getting a whole new set of roommates. But how could I manage that now? Imagine advertising for roommates and saying, 'Oh, and by the way, I'll be dying soon of cancer.' So those are the bad days. But, as I say, there are good days too." "I check into myself often. I ask, 'How're you doing, Ellie?' I tell myself the story of myself. I remind myself of helpful perspectives, for example, that I'm alive now, that I'm happy to be involved in life, not paralyzed with worries as I was a year ago. But in the background there is growing darkness. I'm always aware that I have a fatal condition." "Always there ... it's the static that never goes away. When I meet a friend who is pregnant, I start calculating whether I will still be alive when the baby is born. The chemo I take makes me feel awful. I keep asking myself, 'Is it worth it?' I often play with the thought of decreasing my dose, of trying to fine tune it so that I could feel better and live a couple of months less, say nine or 10 months of good life rather than a year of bad life. And then, there's something else: sometimes I think I grieve for the life I haven't had. I guess I have regrets." That statement instantly caught my attention. An exploration of regrets almost always takes the discussion deeper. "What kind of regrets, Ellie?" "I guess regrets for not being bold enough." She sighed and thought for a minute. "I'm too introverted; I've stayed hidden too much, never married, never stood up for myself at work, never asked for more money. Never spoke out." I considered pursuing the longing and sadness in her voice but instead chose a bolder path. "Ellie, this may seem like a strange question, but let me ask you, Have you been bold enough in this conversation with me today?" I was taking a chance. Though Ellie was being honest and sharing difficult things, somehow, for reasons I couldn't quite put my finger on, I felt a certain distance between us. Perhaps it was my fault, but somehow we weren't fully engaged, and I wanted to remedy that. Many individuals with a fatal illness feel isolated and think that others hold them at arm's length, and I wanted to make certain that wasn't happening here. Redirecting the flow of the interview into the here and now almost always enlivens therapy by tightening the connection between therapist and patient. Ellie was startled by my question. Whispering aloud to herself two or three times, "Have I been bold enough here?" she closed her eyes, thought for a few seconds, and then suddenly opened them, turned to look directly into my eyes, and declared firmly, "No. Certainly not." "And if you were to be bold here, what would you say to me?" "I'd say, 'Why are you charging me so much? Why do you need so much money?'" I was flabbergasted. As I often do, I had deliberately phrased my words in the conditional tense to encourage boldness, but never, not in the farthest realm of my imagination, did I expect such a bold response from this wounded, docile, soft-spoken woman, who seemed overwhelmed with gratitude that I would see her at all. "Uh ... uh," I stuttered, "I'm a bit uh, uh ... flustered. I don't quite know how to answer you." I couldn't think clearly and paused to collect my thoughts. I felt a flush of shame about my fee, especially when I thought of how she was scrimping, taking the bus to my office, scraping money together for her grand tour. In dilemmas like this I eventually turn to my own personal mantra, tell the truth, tell the truth, tell the truth (at least insofar as I deem it helpful to my patient). After a short time I collected myself. "Well, Ellie, obviously I'm uncomfortable at your saying this to me, but first I want you to know—and I really mean this—I'm absolutely thrilled at your boldness just now. And the reason I'm flustered is because you've touched on one of my own personal dilemmas. My immediate reflex was to defend myself and say to you, 'My fee is the going rate for San Francisco psychiatrists,' but I know that's not your point. The fee is high, and your implication is right on: I don't need the money. So you're confronting me with my own personal ambivalence about money. I can't work this through right now, but I do know one thing for sure: I want to make a proposal. I'd like to cut your fee in half. Is that okay? Will that be affordable?" Ellie showed a flash of surprise but then simply nodded appreciatively and then quickly changed the subject by discussing her daily routine and how she often makes things harder for herself by thinking she has to do something very substantial with her limited time, like writing her memoirs or starting a blog. I agreed that this represented an area for work if she were to pursue therapy, but it seemed apparent to me that she had jumped too quickly away from our discussion about fees. For a moment I considered suggesting that we reexamine our feelings about what had just happened, but then I thought, Slow down—you're asking too much of her. This is only a first session. Ellie looked at the clock on the table between our chairs. Our hour was nearly up. She hurriedly offered me some compliments. "It's been good to talk with you today. You really do listen. You do receive me. I feel comfortable with you." "Can you say what I've done that's made it comfortable for you today?" Ellie paused for a few seconds, stared at the ceiling, and then ventured, "Maybe it's because of your age. I've often found it easier to talk about dying with an old person. Maybe it's because I sense that old persons have thought about their own death." Her would-be compliment ruffled me. It was appropriate to talk about her death, but had I signed on to talk about mine? I decided to air my feelings. After all, if I weren't going to be honest, how could I expect it of her? I chose my words carefully. "I know you mean that well, Ellie, and what you say is entirely, indisputably true: I am old, quite old, and I have thought much about my death. But still I'm a bit rattled by your comment. How to put it?" I thought for a few seconds and continued, "You know what it is? I think it's because I just don't want to be defined as an old person .... Yes, yes, I'm sure that's it, and there's a parallel here with what you said earlier. This helps me understand exactly what you meant about not wanting to be defined as a cancer patient." As the hour ended, she asked if we could meet for a second session. It turned out that Fridays, the day I was always in San Francisco, were often not good for Ellie because of her chemotherapy schedule. Nor did she have transportation to meet me in my Palo Alto office, 35 miles away. When I offered to refer her to another therapist in San Francisco, she demurred: "I've gotten much from this hour. I feel enlivened, as though I've been reacquainted with living. I know that in my email I asked for only one or two meetings. But now ..." She stopped, took a deep breath, collected her thoughts, turned to me, and said, "Now I want to ask you something big. I don't want to put you on the spot. I know that you may not be able, or willing, to do this, and I know our schedules don't fit well, and we can't meet every week." She drew a deep breath. 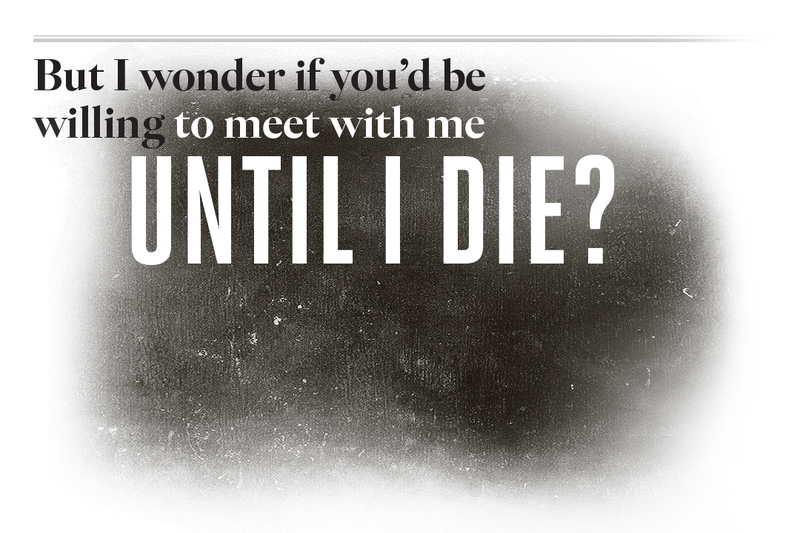 "But I wonder if you'd be willing to meet with me until I die?" Willing to meet with me until I die? What a question! I've never had anyone pose that to me so ... so boldly. I felt honored by her invitation and quickly gave assent. In our second session Ellie entered with a stack of old family photos and the agenda of filling me in completely about her family. Rummaging in the distant past, I was sure, was not the best direction for us to take, and I wondered if Ellie, trying to please me, had mistakenly believed that I wanted her to provide an extensive family history. While I searched for a tactful way of saying this, she commenced to speak with much feeling of her deep love for her sister and brothers. Her eyes grew moist, and when I inquired about her tears, she began to sob about the unbearable pain of never seeing them again. Then, when she regained her composure, she said, "Maybe the Buddhists had it right when they said, 'no attachments, no suffering.'" Propelled to say something helpful, I clumsily fumbled about trying to make a distinction between "love" and "attachment." That went absolutely nowhere. Then I commented on the richness and fulfillment that flowed from her family relationships, and she gently let me know that such reminders were unnecessary, for she already fully appreciated her loving family and was much comforted by the thought that when she needed them at the time of dying, her sister and brothers would all be there for her. This sequence of events reminded me of an important axiom of psychotherapy that I have learned (and forgotten) so many times from so many patients: the most valuable thing I have to offer is my sheer presence. Just be with her, I thought. Stop trying to think of something wise and clever to say. Let go of the search for some dynamite interpretation that will make all the difference. Your job is simply to offer her your full presence. Trust her to find the things she needs from the session. A bit later, Ellie spoke of her strong desire to find some income-producing work. As she described the details of her life, I grew more aware of her truly marginal economic status. She rented a small, one-bedroom apartment in one of San Francisco's most inexpensive areas and adhered to a frugal budget, refusing even the luxury of a taxi to visit my hilltop office. Too ill to hold a paying position for the last two years, she now earned only a few dollars from babysitting and minor editing for a friend. I realized that even my greatly reduced fee was a significant burden and threatened her plan of the grand tour she yearned for. I was rooting for her to take that trip, and I knew that she would be far more likely to afford the splurge if I saw her pro bono, but I sensed her pride would not permit her to accept paying no fee at all. Then an idea occurred to me that might make Ellie more comfortable. Forty years earlier I had seen a very shy patient, also a writer and also unable to pay for therapy. I had suggested an experimental format in which she would write a summary after each session in lieu of payment, and I would do the same, and every few weeks we would read each other's summaries. I had originally considered that exercise only as a learning tool for both of us—I wanted her to learn to be more honest in her comments about our relationship, and I personally wanted to free myself up as a writer. But the resulting summaries proved to be of such significant value in teaching student therapists, that the patient and I jointly published them as a book (Every Day Gets a Little Closer). I told Ellie about this project and proposed that she and I try to rerun this experiment. Given this would not be long-term therapy, I suggested that we both write a summary of each session and email it to the other before the next meeting. Ellie was delighted with this idea, and we agreed to commence immediately. It's a relief to talk to Irv because he has really faced the question of his own death. It's often pretty hard to speak to others about my cancer. I have a number of pet peeves. Many folks are overly solicitous. They can't do enough for you. There's that Kaiser nurse who keeps asking "Isn't there someone who can drive you here?" And some people are too prying. I think they are voyeuristic and attempt to satisfy their morbid curiosity about having cancer. I don't like that and have sometimes wanted to say, "Go get your own damn fatal illness." Too many people are overly respectful, braying, 'You're so brave' and Irv fell smack into that trap. After all what's so courageous about having cancer? Once we have it, what choice do we have? But the worst thing of all—and thank God Irv doesn't do this, at least not yet—is all this nonsensical talk about a patient's courageous struggle with cancer that all too often ends in defeat. How many obituaries do you see stating that so-and-so lost their courageous battle with cancer? I hate that! I absolutely hate it! If someone put that in my obituary, I'd come back and kill him! But Ellie's health soon began to deteriorate rapidly. Her chemotherapy was no longer effective, and she grew fatigued and anorexic, and required several hospitalizations to deal with her ascites—an accumulation of abdominal fluid. It soon became apparent that Ellie's dream of the grand tour was not to be, and neither she nor I spoke of it again. And neither would there be a book of our post-session summaries. We ended up meeting for only six sessions, and our summaries were stilted and uninspired. Though hers had a bit of sparkle, her fatigue showed through, and her summaries were burdened with repetitive expressions of gratitude to me for seeing her without a fee. My summaries were cautious and superficial because it was so apparent that Ellie had little energy for engagement. She was obviously dying, and I felt it inappropriate to comment on nuances of our relationship. And so we missed one another and never experienced the authentic encounter I had originally sought. Moreover, during this period I was entirely consumed with the task of finishing a novel (The Spinoza Problem); I departed on a long planned one-month retreat during which I put all else out of mind and worked nonstop on my final pages until the day I was jolted by Ellie's email letting me know she had stopped all eating and drinking and soon would be dead. I felt both shocked and guilty. Shocked because, even though I knew she was terminally ill, I evidently compartmentalized the knowledge that she was so close to death so as to have all my energy available for writing. And guilty because I knew I could have offered her more of myself. I could have paid home visits when she was too ill to travel, and I could have engaged her more fully in the sessions and in the summaries I sent to her. Dr. Yalom is an emeritus professor of psychiatry at Stanford University. 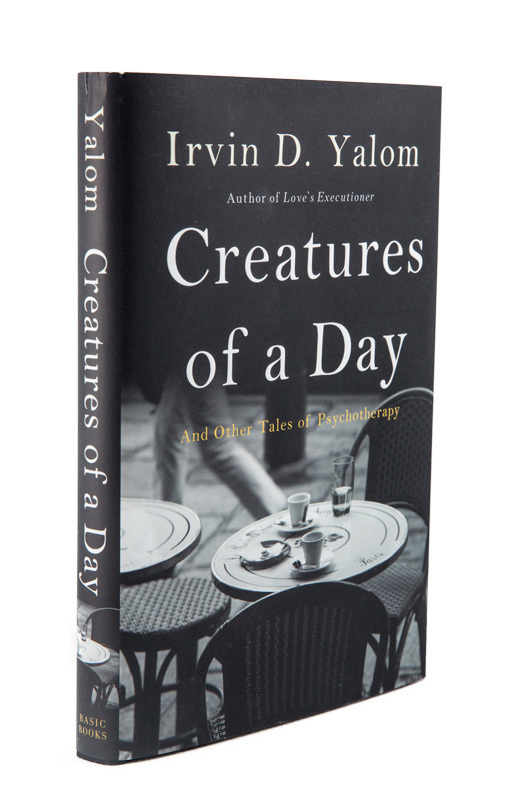 This article is adapted from his new book, Creatures of a Day: And Other Tales of Psychology (in paperback March 2016), from Basic Books, a member of The Perseus Books Group. Copyright © 2015. Why had we not connected more fully? My first answer to that question was that Ellie simply lacked the ability for deep relationships. After all, she had never married nor maintained a deep and lengthy love connection with any partner. She had moved many times and had had a great number of roommates but few truly intimate friendships. But I failed to convince myself: I knew this wasn't the whole story. I knew that for some reason I had withheld myself from her. Truly shaken by her email, I felt compelled to put my novel on hold for a while and devote myself to Ellie by rereading, meticulously, all our summaries and correspondence. It was an eyeopening experience—so many of her statements staggered me with their great power and wisdom. Again and again I checked the dates of her emails. Had I really read these messages before? How could that be? Why did these strikingly poignant words seem unfamiliar, as though I were seeing them for the first time? I decided to collect Ellie's wisest and most powerful words and write this remembrance of her. I phoned Ellie and told her what I wanted to do and asked her permission. She was pleased and had only one request: that I use her real name rather than a pseudonym. I hate having to explain my situation to people whoare novices to dying. Irv puts me at ease and he's not afraid to go into the darkness with me. I can't speak this way to others. It's hard work, too hard, explaining to them that my cancer is incurable. People can't help asking, "How long will you be on chemo?" which is an upsetting question. Don't they get it? Don't they get that my illness is not going to go away? I need people who can look straight into my eyes. Irv is good at that. He doesn't look away. These and a great many similar comments persuaded me that, despite my sense that I had failed to connect with her, I had offered her something precious by my willingness to accompany her into the darkness and not flinching when she discussed her death. The more I read, the more I wondered how I was able to do that. I do my best thinking on my bicycle, so I took a long ride along the southern Kauai coast pondering that question. For sure it was not because I had entirely overcome my own fear of death. That had been a work in progress, an ongoing project, for a very long time. Forty years ago, when I first began working with patients with terminal cancer, I was buffeted by storms of death anxiety and frequent nightmares. At that time, seeking solace, I sifted through memories of my personal psychotherapy, a 700-hour personal psychoanalysis during my residency in psychiatry, and was stunned to realize that not once in those 700 hours did the topic of death arise. Incredible! My ultimate perishing—the most terrifying fact of my life—had never surfaced, never once spoken of, in that long personal analysis. (Perhaps my analyst, at that time in her late seventies, was protecting herself from her own death anxiety.) I realized that, if I were going to work with terminally ill patients, I needed to do some personal work on my own mortal fears, and I reentered therapy with a psychologist, Rollo May, whose writings suggested a keen sensibility to existential issues. I can't pinpoint exactly how my therapy with him helped, but I do know that I wrestled with the fact of my death again and again in our work. Rollo was older than I, and looking back on our meetings, I am certain that I often made him anxious. But, to his credit, he never backed away and, instead, consistently pressed me to go ever deeper. Perhaps it was simply the process of opening closed doors and examining and embracing every aspect of my existential situation in the presence of a gentle and sensitive guide that made the difference. Gradually, over the course of several months, my death anxiety diminished, and I grew more comfortable in my work with terminally ill patients. Other people, even others who also have cancer, tell me "You're going to live 30 years." They tell themselves, "I'm not going to die of this." Even Nancy in my support group, so wise and clear-sighted, e-mailed yesterday "All we can hope for is to hang on long enough until better treatments are developed." But this isn't what I want to hear. This is a safety net with an enormous hole right in the middle. Whether I will live a long time or a short time, I'm alive now, at this moment. What I want is to know that there are other things to hope for besides length of life. What I want to know is that it isn't necessary to turn away from thoughts of suffering or death but neither is it necessary to give these thoughts too much time and space. What I want is to be intimate with the knowledge that life is temporary. And then, in the light (or shadow) of that knowledge, to know how to live. How to live now. Here's the thing I've learned about cancer—it shows you mortal illness and then spits you back, back to the world, to your life, to all its pleasure and sweetness, which you feel now so much more than ever. And you know that something has been given and something has been taken away. "Something has been given and something taken away." I knew what Ellie meant. It was a simple yet complex thought—a thought that must be unpacked slowly. What has been given is a new perspective on living life, and what has been taken away is the illusion of limitless life and the belief in a personal specialness exempting us from natural law. I'm alive now and that's what matters. Life is temporary—always, for everyone. My work is to live until I die. My work is to make peace with my body and to love it, whole and entire, so that, from that stable core, I can reach out with strength and generosity. After a while each one stops working. It loses its power. Ideas are just like the cancer drugs. Except that the ideas are more resilient—they wear out, lay low for some time, as though they are taking a rest, and then come back revitalized, and also better and stronger new ones keep coming. Often, especially early in the course of her illness, Ellie was plagued by envy of the living and healthy. She knew these meanspirited sentiments were unhealthy to her mind and body and struggled to overcome them. The very last time I saw Ellie she told me something remarkable: "Now no more envy. It is gone. In fact, I'm able to feel generous. Maybe I can be a kind of pioneer of dying for my friends and siblings. It sounds weird, maybe Pollyannaish, but it sustains me and is a thought that doesn't fade like the others." A pioneer of dying—what an extraordinary phrase! This took me back 40 years, to the first time I encountered this idea in my work as a therapist. In my first group of patients with cancer, I tried hard, week after week, to comfort a gravely ill woman. I've forgotten her name, but I remember her essence and still, with great clarity, can see her despondent, deeply lined face and her sad, downcast grey eyes. One day she startled all of us in the group when she arrived looking bright and revitalized. She announced: "I've made a big decision this week. I've decided to be a model for my children-a model of how to die!" And indeed, until she died, she modeled grace and dignity, not only for her children but also for the group members and for everyone who came in contact with her. The idea of modeling how to die permits one to imbue life with meaning until the very last moment. Over the years, I passed her insight along to many patients, but Ellie's strong language ("a pioneer of dying") gave it even greater force. As Nietzsche said, "If we have our own 'why' of life, we shall get along with any 'how.'" For family and friends I'm more of a scarce commodity. And I feel special to myself also. My time feels more valuable. I feel a sense of importance, gravitas, confidence. I think I'm actually less afraid of dying than I was before cancer, but I'm more preoccupied with it. I don't worry about getting old. I don't give myself a hard time about what I'm doing or not doing. I feel like I have not just permission but almost a mandate to enjoy myself. I love the advice I came across on some cancer website: "Enjoy every sandwich." Throughout all of this, she never lost her droll sense of humor. I didn't get much done today (or all week, come to that), but after all, I have cancer. It's nice, but I'm getting spoiled. Time to raise the bar. Almost all of Ellie's comments on her death were arresting. I reread each one several times. Over and again I wondered how I could have read them before and yet have so little memory of them. Having been one of those exhausting children who can't let a subject drop, I pinned Mom down on the death question when I was four or five. She spoke of heaven but it didn't really help. When I looked at the sky all I saw was sky. I ran and hid behind my father's big leather armchair, the one that was pushed up against a corner. I figured I would just stay there forever and death wouldn't find me. The Buddhists advise living with death on your left shoulder; sometimes I feel like it's sitting on both shoulders and in fact has climbed right inside my body. Which of course is exactly where it has always been. My work is to love my body, all of it. Whole and entire. The whole aging mortal troublesome failing miraculous intricate breathing doomed cancerous warm mortifying unreliable hard-working imperfect beautiful appalling living struggling tender frightened frightening living dying living breathing temporary wondrous mystifying afflicted mortally-ill assemblage of the atoms of the universe that is my self, is me, for this space of time. This body that is screwing up. That is growing terrible and dangerous tumors. That is failing to turn them back, destroy them, dissolve them, annihilate them. This body that is failing at the one essential job of life, to stay alive, to stay alive. I stared at a mirror and I saw a human face, vulnerable, living, beloved, transitory. I didn't examine my skin for clogged pores or fluff my bangs or form any opinion at all about my appearance. I looked straight into the eyes that looked straight back and I thought, oh, poor darling, poor kid. I think it was the first time I ever saw my face like that—whole. These lines brought tears to my eyes. The image of Ellie staring at herself in the mirror and saying, "oh, poor darling, poor kid," tugged at my heart and also ignited my fears for myself. Death anxiety never really disappears, especially for those like me who continue to poke around in their unconscious. Even after all that work on myself, I continue to have my occasional 3 a.m. awakenings during which I replay scenes in which I learn of my own fatal diagnosis, or lie on my deathbed, or imagine my wife's grief. 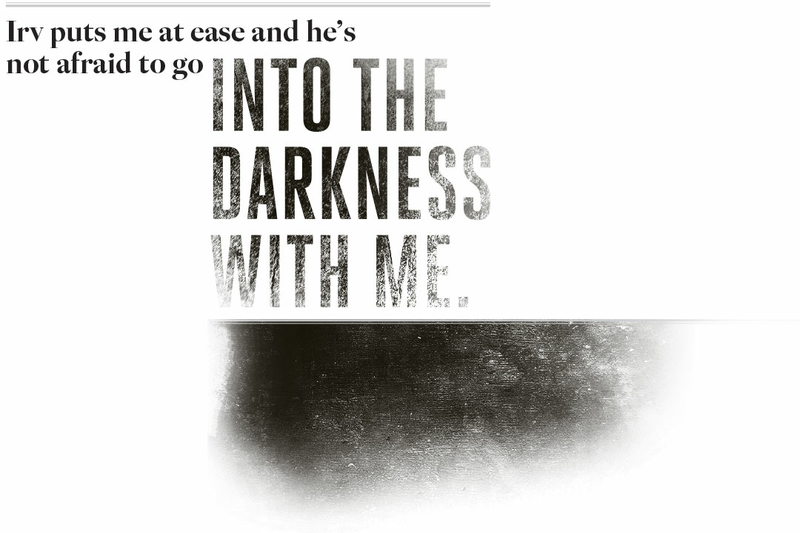 Yet Ellie had said I was fully present, fully willing to enter the darkest places with her. I knew there was truth to that but wasn't sure how I had managed to do it. Part of an answer came as I monitored my reactions while rereading these written reflections in one of her summaries. Life is temporary—always, for everyone. We always carry our death in our bodies. But to feel it, to feel a particular death with a particular name—that is very different. As I read these words, I observed myself understanding, nodding, agreeing with Ellie's words, but when I turned up the volume and listened even more closely, I heard a muffled voice from the depths of my mind saying, Yes, yes, all that is very well, Ellie, but let's be frank, you and I ... we're not the same. You, poor thing, are the afflicted one, the one with the cancer, and I feel for you, and I'll help in every way I can. But me, I'm healthy—cancer free. Alive. Free from danger. Yet Ellie was a perceptive woman. How could she have said repeatedly I was the one person she could really relate to? She said that I looked directly into her eyes without flinching, that I received her and could hold everything she said to me. What a conundrum. As I pored over her messages, I gradually began to understand. I did get close to Ellie. But not too close! Not dangerously close. I had falsely blamed her for our lack of intimacy. But she was not the problem. She had enormous capacity for intimacy. I was the problem. I was protecting myself. Am I pleased with myself? No, of course not. But perhaps my denial allowed me to do my work. I now believe that all of us who work with the terminally ill must hold these contradictions. We must continually work on ourselves. We must coax ourselves to stay connected and not be too hard on ourselves for being human, all too human. I look back on my time with Ellie with many regrets. I have regrets for Ellie, regrets that she never lived boldly, that she died young, and that she never took that grand tour. But now, as I look back at my experience with Ellie, I feel regret for myself. In our meetings it was I, not Ellie, who was shortchanged. I missed an extraordinary opportunity for a deeper encounter with a great-souled woman.